If there’s one buzzword that sums up the beginning of 2019 it would be ‘uncertainty’. As the country counts down to the Brexit deadline on March 29, the property market is looking ahead to the future. While the market has proven resilient to upheaval in the past, uncertainty is much more difficult to navigate. No-one knows exactly how the market will react to Brexit or even if it will happen. Despite that, industry experts continue to predict where we’re heading in 2019. Alongside figures from HomeTrack, we can paint a picture of where the property market is right now and what that could mean for the future. Firstly, the facts. According to HomeTrack, towards the end of 2018, a number of trends could be noted up and down the country. Mainly affected by price falls in the capital and slow down across the South, the headline rate of growth is the lowest it has been for five years. Meanwhile, heading North, Edinburgh is the fastest growing city, recording rises of 6.8%, closely followed by Liverpool (6.3%) and Birmingham (5.9%). Although politically Brexit continues to intensify, transactional data regarding the property market shows that buyers are continuing to purchase at a steady rate, with growth in regional markets. Ten cities have recorded double-digit price growth since the Brexit vote in 2016, led by Birmingham (16%) and Manchester (15%). 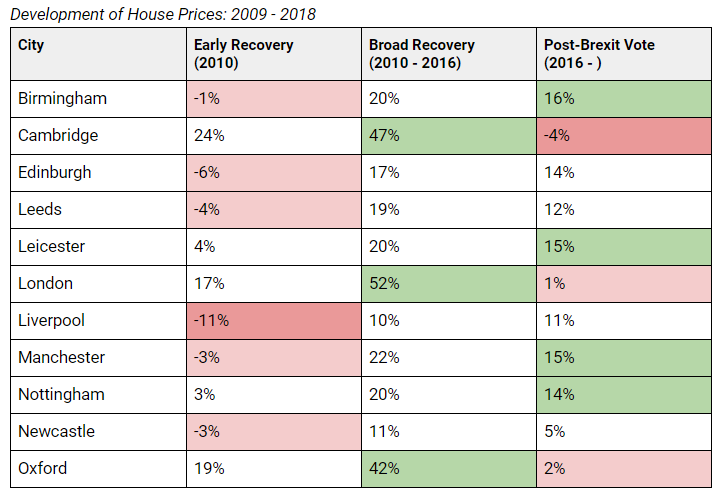 The table below shows the property price growth of several key destinations immediately post-recession and after Brexit. While London led the post-recession growth in 2010 – 2016, regional cities outside of the South East have since take over, topping the growth leaderboards over the last two years nad averaging a maximum growth of around 7% per year. 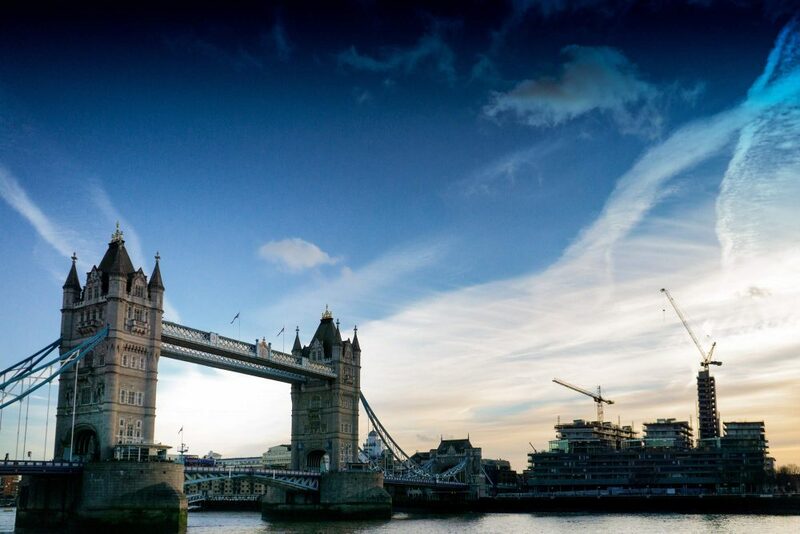 Across the UK property market we can see that while growth is slower and London is continuing to experience stagnant prices, there are exceptions to the rule. In the North, the markets are much more resilient with robust price growth and a lot more activity. Affordability is playing a huge part in this continued ‘renaissance’ and regional cores are becoming much more lucrative with the right investment. There is also plenty of potential in ‘second-tier’ cities and towns in the Midlands and the North. While these markets won’t offer the same returns as areas such as Birmingham’ the relative affordability would make investment opportunities much more attractive for investors. Knight Frank agree that affordability is a key theme in the 2019 market and properties that are closer to the average salary in the area are continuing to see more activity, even despite the ongoing uncertainty. Property prices are expected to be driven by buyer confidence rather than affordability, while uncertainty will continue well into the forecasted period, regardless of the Brexit outcome. This level of caution is likely to ensure that house price growth will remain slow at a national level. Knight Frank believes that price growth will remain largely unchanged during 2019, declining around the capital but remaining positive in the North, the Midlands and around Yorkshire. They expect a cumulative growth of 10.3% by the end of 2023. In the buy-to-let market, Savills expect continued rental price growth as an undersupply of properties continues to affect the overall UK market. As an ongoing issue, it’s not a stretch to imagine that standards will be put into place for local authorities on delivering the required amount of homes, encouraging more planning consents in areas where demand is highest. Savills also expect that the need for more housing in these high-demand areas will drive more diverse property types being made available. These asset types will generally include affordable housing and an increase in the amount of build-to-rent properties – which continues to grow in popularity. While these are all predictions that have been asserted from current research in the sector, it’s important to consider that this is an unprecedented situation and really, no-one knows exactly what will happen post-Brexit.